Cheddar’s will join Freddy’s at the Epps Bridge Parkway entrance to the shopping mall and is part of a construction boom in the area. Kroger has a gas station substantially completed in the shopping center across Epps Bridge Parkway from Epps Bridge Centre, and construction is underway in front of Lowe’s across the Oconee Connector from the new shopping mall. Also last month the county issued a permit for interior buildout of one of the shells in Epps Bridge Centre for a di’lishi Frozen Yogurt Bar. The interior permit for another building to house Kinnucan’s was issued in late May. The county’s commercial center at Butler’s Crossing also is experiencing some new interest. The county received updated site plans for a dormant commercial development on Hog Mountain Road in late May. The Cheddar’s construction set shows details of the configuration of the Cheddar’s and the Freddy’s stores, which will be built across what originally had been configured as two separate outparcels at Epps Bridge Centre. Entry to the two restaurants will be via three driveways off the main mall roadway. The two restaurants will be between the mall entrance and sign and the undisturbed property to the west belonging to the Georgia Department of Transportation. Consistent with the preliminary site plans filed in late March, the most recent plans call for a 8,465-square-foot building seating 324 persons and with 206 parking spaces. The plans also include an outdoor patio seating 60 persons. C&P Company of Macon submitted the preliminary site plans in March for the Cheddar’s, which serves steaks, chicken, seafood, burgers, salads and desserts. It now seems likely liquor-by-the drink will be placed on the November ballot by the Board of Commissioners, but the county has a history of turning down such referendums. On April 25, TGC Development Group of Wichita, Kan., submitted plans for a Freddy’s Frozen Custard And Steakburgers store. The plans show a 3,344-square-foot building with 50 parking spaces and the drive-through operation. The Kroger Fuel Center is on an outparcel carved from the parking lot of The Home Depot, some distance from the Kroger store. Site plans filed in April show two entrances to the gas station, one off the Oconee Connector just east of the Tires Plus store, and the other from the Home Depot parking lot. The fuel center will care 62 parking spaces out of the 551 in the original configuration for the Home Depot, leaving 489 parking spaces. The Home Depot is required to have 510 parking spaces, given the square footage of the store. B.R. White, director of the Oconee County Planning Department, told me that his office gave Home Depot an administrative variance, as allowed by county ordinance, because of the size of the discrepancy between available and required parking spaces. Lowe’s was granted a modification of its zoning in early 2012 to allow for the creation of the commercial outparcels in front of its store and to reduce the number of parking spaces from 707 to 459. The site development plans submitted in April for the outparcels show a 6,510-square-foot building for a Kaufmann Tire store on the 1-acre parcel carved from the Lowe’s parking lot. The store is surrounded by parking spaces. Those plans show additional space for a restaurant and another retail store. As part of the rezone plan approved in 2012, Lowe’s agreed to change the roadways inside its property to accommodate the new buildings. The county issued an interior building permit for di’lishi Frozen Yogurt Bar, an Asheboro, N.C., company, on June 12. The store, in which customers make their own yogurt dishes, will be located in the same building as the Lifeway Christian Store and just to the east of the already open Taqueria Tsunami restaurant and Gigi’s Cupcakes. The interior buildout for di’lishi is expected to be completed by the end of the month, according to the building permit. The building area is 2,400 square feet. The Kinnucan’s will be located in a suite in the same building but around the corner from the dilishi store. The county issued the interior buildout permit for Kinnucan’s on May 20. The original estimated finish date for the construction was the first of this month, but interior work on the store is not complete. The county issued a permit for the 13,200-square-foot building shell in which the Kinnucan’s will be located back in January. The May 20 interior permit does not specify how much of that space will be used by Kinnucan’s. Kinnucan’s, based in Auburn, Ala., sells footwear, cold and warm weather apparel, sunglasses, collegiate goods and women’s fashion. Best Buy is advertising July 11 as the grand opening of its store, located across the parking lot from the future Kinnucan’s. 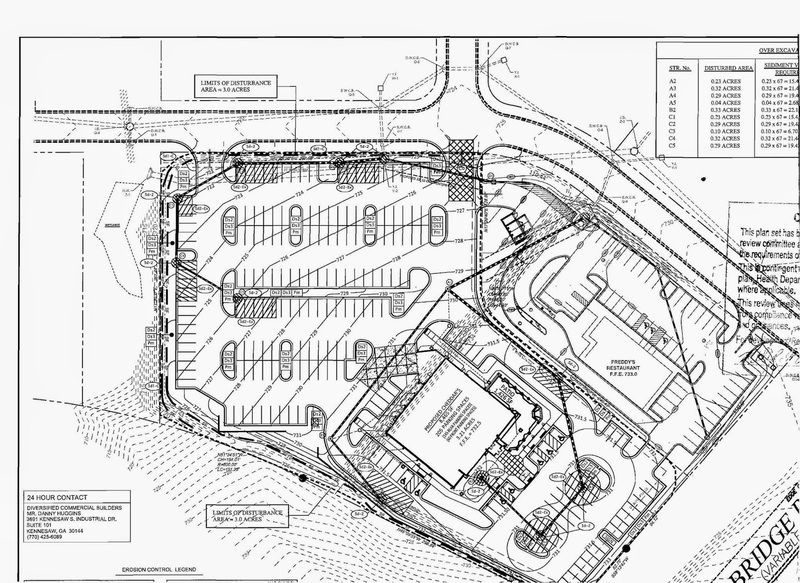 Stonebridge Partners LLC has dusted off plans for a 7.5-acre commercial project on Hog Mountain Road just west of the Butler’s Crossing shopping center that houses Publix. Stonebridge Partners submitted preliminary site plans for clearning, grubbing, pad and utility construction for the project on May 27. The original plans had expired. The plans show pads for three structures, one for a building facing Hog Moutain Road and the other two off an extension of the current entrance to the strip mall in which a new Subway is located. The plans do not show the intended use of the proposed buildings. The Butler’s Crossing shopping center currently has vacant space where Blockbuster video and other stores formerly were located. The Bell’s Food Store Plaza across Experiment Station Road also has vacant space. The two lots owned by JJMB LLC at the Daniells Bridge Road intersection with the Oconee Connector have been leveled and cleared, but no plans have been submitted to the Oconee County Planning Department for either of them. The project is known as Daniells Bridge Promenade. JJMB LLC has its official address at 1010 Prince Avenue in Athens, and Dr. James J McDonald Jr. is the agent. The Boswell Group is listing the property on the southwest corner, diagonal to the QuikTrip. Boswell also has listing for a number of other properties in and near the SR 316 and Oconee Connector intersection.